The young lady in St Andrew’s is named Bethany, is 17 and from Walsall in the West Midlands. She has been held in ‘seclusion’ in that hospital for 21 months, so likely since she was 15. 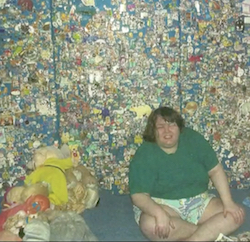 The room is bare and has only a chair and a bed, which itself consists of a mattress covered in plastic. She is fed through a hatch in the metal door, she talks to him over the phone through it while someone standing on the other side holds it, and when her father visits, he has to talk to her through it. They do not explain why they cannot let him into the same room as his daughter, but they did say that she had been outside it only a few times in the last year and three quarters, which indicates that she is not let out to wash on a regular basis. They mentioned that she is prone to self-harm and had embedded bits of a biro pen in her arm, which it was supposedly too dangerous to take her to hospital to get removed; she has also become clinically obese during her time locked up. Her father says that on the phone, they talk about what they could do if she was somewhere else, meaning a suitable placement in the community; she used to love going to the circus, but he has been unable to do that (or anything else) with her since she has been there. The hospital do not take her out for activities because they are short of staff. Earlier this year, she was supposed to be moving to a community placement but at the last minute, Walsall borough council pulled out, claiming that her needs were too specialised for it to be suitable. Her father, Jeremy, says that every three months he attends meetings at which institution staff say that it’s all terrible but nothing changes. As she is detained under the Mental Health Act (or ‘sectioned’), he is powerless to remove her from this situation; it is in the power of the responsible clinician. The programme exposed a number of conflicts, one of them being that local authorities are resistant to funding bespoke support arrangements because they cost money; they prefer to keep people with complex needs in the mental health system because the NHS pays for that. Local authorities have been a prime target for government cutbacks since the 2010-15 coalition came to power, because the ‘glamorous’ state services have been taken over by bureaucracies which answer to central government — in particular, health and the academy school system. Local authorities run non-academy schools (which are unfavoured), social services (which have been cut to the bone) and services such as bin collection which can be privatised. However, it really failed to ask why private institutions such as St Andrew’s and the private units run by companies such as Cygnet and Priory do not have the staff to offer a humanly dignified standard of care to people like Bethany. The likely reason is that the prices they charge do not allow them to hire enough staff for that purpose, and behind that lies a competitive tendering system that means there is a drive to bring costs down. There is also a history of ‘soft’ inquests that are reluctant to find neglect or wrongdoing where a disabled person has been killed as a result of doctors’ or commissioners’ decisions (e.g. Stephanie Bincliffe and, earlier this year, Oliver MacGowan); bosses know that the legal system will take their side even when, to any outsider, someone’s death appears to be an obvious result of arrogance, carelessness or incompetence. To combat this there must be some minimum standard of care; mental health patients who are detained for more than, say, a certain number of weeks must be taken out at least a certain number of times, have activities available, have access to a shower on a regular basis and so on. Bethany’s care is costing £12,000 per week; there is simply no excuse for someone’s care to cost that much and be so poor. We do not know the full details of how Bethany came to be in the seclusion room; we were given a brief telling of her life story by her father. But she has been in this situation for 21 months and if it were possible for her to be in a community placement and go to the circus, it is possible for a hospital to provide decent care in the interim. We heard her speak and she is able to do so coherently; she sounded calm on the phone and likes to sing her favourite song (Three Little Birds by Bob Marley) to him. If the people running this hospital do not have the wit to work out how to accommodate her dignity and her need for fresh air, human contact and stimulation in all that time, they are in the wrong job, and if they cannot get the staff, their financial model is all wrong. There’s just no excuse. To me, statistics only have so much impact and the finances are of less relevance than the human suffering involved, especially when the treatment in question would result in prosecution if it were done to a dog and be at least controversial if done to a convicted criminal, and it killed someone a lot like Bethany only a couple of years ago. Clearly the standards are not tough enough and some of the people making decisions that affect people’s lives for years to come are in the wrong jobs. Previous story A bridge to Ireland?